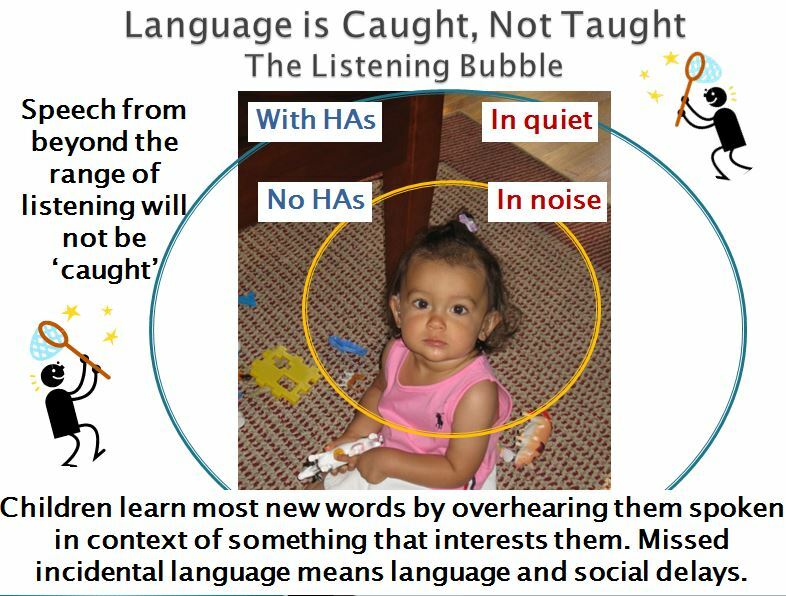 When we think of the needs of children with hearing loss, it is widely known that they are very likely to have significant delays in language skills without early, effective and meaningful interactions with those around them. Hearing loss is a distance sense, which allows people to hear what is going on around them, from a few inches to many feet away in some situations. What is universal to children with hearing loss is that they have a reduced listening bubble, meaning that they are unable to overhear conversations going on around them beyond a few feet. Hearing aids have a very small microphone and pick up sound best in a quiet room when the speaker is within 3-6 feet. The distance between the ears of a child sitting on the floor near a standing parent is often further than 3-6 feet. Along with fewer words learned, children with hearing loss are at high risk for not learning what typically hearing age mates know about social communication, or pragmatic language use. Pragmatic language skills are the most abstract and complex of all language skills. Even when the child has age-appropriate vocabulary and syntax (grammar) skills, she or he may not yet have learned how to use these skills in a socially appropriate manner for specific social purposes. Young children with typical hearing acquire these skills rapidly between 3 and 4 years of age and are able to use these pragmatic language skills using complex language. 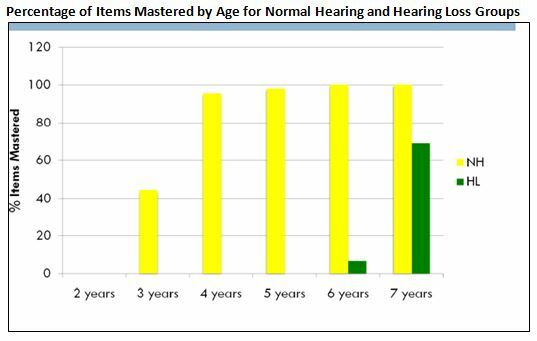 Children with hearing loss acquire these skills much more slowly even when provided early intervention and preschool services. Even at the age of 7, typical children with hearing loss have the pragmatic language skills similar to a 3-year-old. Without mastery of these skills, children will encounter significant challenges with literacy, written communication, and abstract conversational communication – all of which effects success in school and in getting along with peers. Being “socially awkward” and “not fitting in” all relate to pragmatic language skills and theory of mind. The area of social cognition, or the ability to recognize emotional state in others, appears especially weak in children with hearing loss, with 7-year-olds having the ability to identify and explain feelings in a manner that is typical of a 3-year-old. This is why it is imperative to address social cognition specifically when a child has a hearing loss. (See intervention products below for intervention ideas). A 2012 study asked parents to complete a 45-item checklist about how their child uses social communication skills. It was completed by parents of 109 children with typical hearing and parents of 126 children with hearing loss of all degrees between age 2-7 years. For each of the 45 items the parents had to decide if the child did not use any communication (not present), used no words (point, yank, other preverbal gestures), used 1-3 words to express the communication in the item or was able to use complex language. Even children with “mild” degrees of hearing loss (26-40 dB) had substantial developmental delays in the area of social communication. Assess specifically in the area of pragmatics. With 80% or more children with hearing loss being educated mainly in the mainstream, the ability to interact socially is crucial to their full participation in the classroom and acceptance by their peers. In order to identify deficits in social communication we must expand the scope of a comprehensive oral language evaluation to include daily pragmatic language behaviors. Most standard instruments used to assess language do NOT provide a norm-referenced, valid or reliable measures of social communication and therefore substantially miss or underestimate this important area of development (i.e., TOLD, OWLS). Although the CELF-4 contains a Pragmatic Profile, it provides no normative data or standard scores (CELF-5 does have a teacher-completed Pragmatic Profile). The extensive CASL does tap into pragmatics, but it measures a student’s knowledge of pragmatics rather than actual use in school and social situations. It is up to the parents and professionals who specialize in supporting students with hearing loss to advocate for appropriate measures of pragmatic language use. What assessments should be used? For a hierarchy of expectations for the development of pragmatic language and Theory of Mind skills for ages 6 months through 7 years access the Summary of Social Interaction (Pragmatic) Development / Theory of Mind handout (in Teacher Tools). The Language Use Inventory is completed by families for children ages 18-47 months. It has great norms and validity. The downside is the expense of the test and the length of the protocol that must be completed by families. If your agency will pay for it and your families will complete all of the pages, you will end up with a clear trajectory of pragmatics language learning as children transition from early intervention and eligibility for specialized instruction is considered. The reality is that the expense and parent completion really can be very significant issues. Most growth of pragmatic language skills occurs between 30-48 months. We really need a snapshot as to whether a child seems to be ‘on target’ at the time of eligibility from early intervention and for planning/monitoring during preschool. The Pragmatics Checklist, used in the study described above has been included free for use by teachers/clinicians in their work with families of young children with hearing loss.A computer fillable version of the Pragmatics Checklist is also available. It fits on one page and can be completed individually by the parents or as part of an interview dialogue with the early interventionist. The majority (75%) of children will be able to use complex language (full expressions of more than 3 words) per the following: Age 3: 20 of 45 items; Age 4: 43 of 45 items; Age 5: 44 of 45 items; Age 6: 45 items. Therefore, at transition, a child should have mastered 20 of the items using complex language. By entry into kindergarten, all items can be expected using complex language. Based on the results of the study however, it is more likely that the child with hearing loss will exhibit challenges in some or most of the areas listed above as pragmatic skill areas of weakness. To provide further specificity of expected attainment of each of the skills, refer to the Pragmatics Checklist Interpretation which provides the age of mastery in months (75% of the age group can perform using complex language) and when emergence using 1-3 words and using complex language can be expected. RECOMMENDATION: The Pragmatics Checklist will be completed by families at least annually for all children with hearing loss ages 3, 4, and as part of planning for kindergarten readiness. Hierarchy of skill development for children ages 6 months to 8 years = Summary of Pragmatic Development + Theory of Mind (in Teacher Tools). Download the resource Teaching Your Child to Identify and Express Emotions and share it with families. Because the normative results for The Pragmatics Checklist included children with hearing loss up to age 7, it is appropriate for use through grade 2 as a parent-completed checklist. For ages 5, 6, 7 it is desired for the parents to identify any of the items in which the child is able to only use a few words to express themselves, especially for the 17 items that mastery is achieved between 48-54 months and the 1 item of mastery between 54-60 months. If the checklist has been completed by the families before and they have already checked that the earlier skills were mastered, it would be appropriate to just circle the items of interest (non mastered and/or most age-appropriate). Interpretation guide shown is available in Teacher Tools. For a norm-referenced diagnostic tool the Pragmatic Language Skills Inventory (PLSI) is for students age 5.0-12.11 years. This checklist has 45 items that can be completed by the teacher in 10-15 minutes. It has three subscales: Personal Interaction Skills, Classroom Interaction Skills and Social Interaction Skills. The PLSI has strong psychometrics to be able to clearly identify issues, even for children as young as kindergarten. 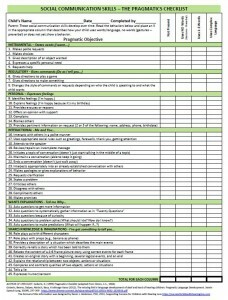 Another, or additional option, that may be useful for monitoring development or program planning is Checklist of Socio-Pragmatic Language Behaviors for Students with Sensory Impairment. 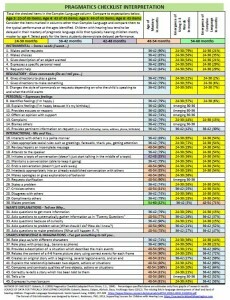 This checklist was found on the internet authorless, and was reformatted to fit on one page. It has been included free for use. 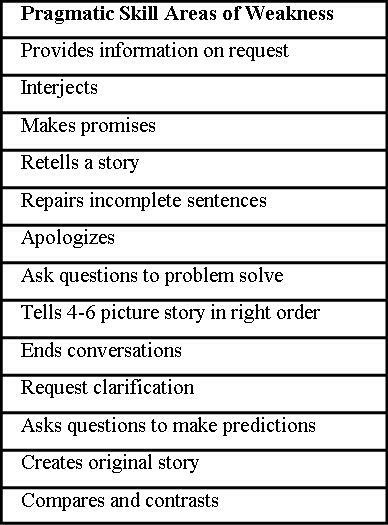 It includes many of the items from the Pragmatics Checklist in a manner more appropriate to school-age (K+) students. It is NOT normed or validated in any way but could be useful for planning or monitoring progress. If you developed this material please contact me so your name can be specified as author. 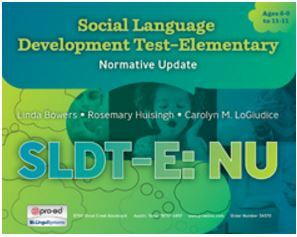 An excellent norm-referenced test to use is the Social Language Development Test, which can be administered starting at age 6. It has four subtests: making inferences; personal negotiations; multiple interpretations, and supporting peers. The test assesses students’ language-based responses to portrayed, peer-to-peer situations which is unlike other tests which rely on observation forms, like the PLSI or PLOS. There are tests specific to pragmatic language development that are appropriate starting at kindergarten age, however expense and time commitment to complete should be carefully considered. Regardless of the instrument, the person completing the checklist needs to be very, very familiar with the child’s behavior and what is typical for age peers. RECOMMENDATION: Every student with hearing loss should be tested for pragmatic language deficits. The 18 older age (4-5 years) items of the Pragmatics Checklist can be completed as a screening measure by families for children with hearing loss ages 5, 6 and 7 (kindergarten through grade 2) prior to school entry or in the first couple of weeks of school. 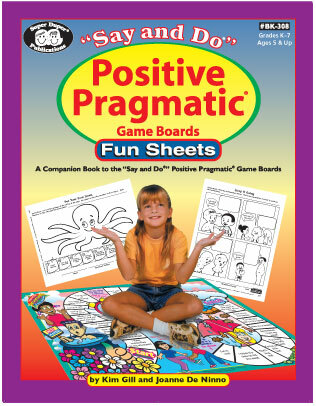 Once the classroom teacher has observed the student 6 weeks or longer, the PLSI can be given to determine pragmatic language behavior issues. If a child is identified as having pragmatic language behavior issues in the classroom, the SLDT can be given to define the pragmatic language deficit. 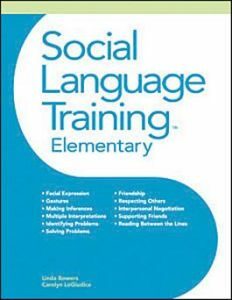 In addition, the teacher of the deaf/hard of hearing can consider the social communication skills represented on the Checklist of Socio-Pragmatic Language Behaviors for Students with Sensory Impairment for student planning and monitoring of progress. 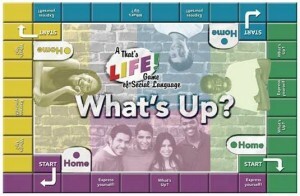 Share Improving Your Child’s Social Skills with families. Again, there are tests that tap into pragmatics skill development for this age group (refer to list of assessment instruments). Most students with hearing loss are educated in the regular education mainstream classroom and have a classroom teacher who has observed their behavior over the course of many days and many situations. 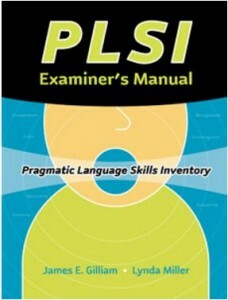 To initially explore pragmatic language skills, what seems most practical to obtain a snapshot as to whether a student seems to be ‘on target’ is a checklist that can be quickly completed by the classroom teacher and is also a valid measure of the student’s use of spoken language in school and social situations. 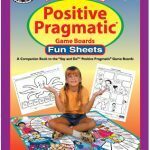 The Pragmatic Language Skills Inventory (PLSI) has 45 items for the teacher to complete for students ages 5.0 – 12.11 years. Cut-off scores are provided for determining whether the student exhibits characteristics of a pragmatic language disorder. Guidelines are provided to assist the examiner in interpreting the results. RECOMMENDATION: That the classroom teacher annually complete the Pragmatic Language Skills Inventory for children in grades 3-6. The Social Language Development Test can be used to further diagnose the pragmatic language deficit that has been identified by these teacher checklists. An increasing number of students with hearing loss are not being identified as eligible upon school age, using a standard battery of language assessments. The results can also be used to support the referral of a student with hearing loss for educational assessment who was found to be previously ineligible. As part of that assessment an instrument specific to evaluating pragmatic language and valid comparison of results to normative performance can/should be performed. Planning: A pdf of a 2012 PowerPoint presentation on Pragmatic Puzzle PPT_Practical Solutions for Evaluation and Treatment – Fleckenstein, Mary Michelle presents an overview of pragmatic language, choosing tests to determine pragmatic disorders, report writing for pragmatic disorders (includes detailed example), samples of goal writing, and a summary of intervention tools available. One resource that suggests intervention for pragmatic language development, especially for young children, is available for consideration (The Missing Link in Language Development of Deaf and Hard of Hearing Children: Pragmatic Language Development). An interesting British study researched the effectiveness of different interventions for children aged 6-10 years with pragmatic language deficits after 8 weeks of treatment (1 hour 3 times/week). Areas of intervention were: a) pragmatic rules in discourse and conversation; b) turn-taking; c) meta-pragmatics; d) social understanding and social role-playing; e) formulation of conversation and narrative; and f) inferential understanding. All children showed positive change, some more than others. 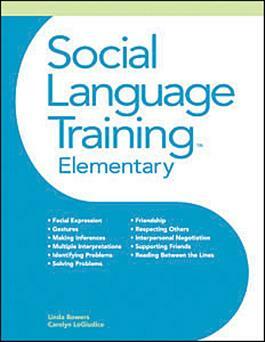 Authors are careful to say that this intensive treatment schedule lacks evidence to show it is needed for every student, they do indicate addressing the above areas will result in improvement in student’s social communication behavior. Use this link to refer to another study that provides information on successful intervention. There are a wide variety of intervention materials available for pragmatic communication learning, especially with the rise of students on the Autism Spectrum (see suggested tools at the end of the PowerPoint presentation mentioned under Planning). 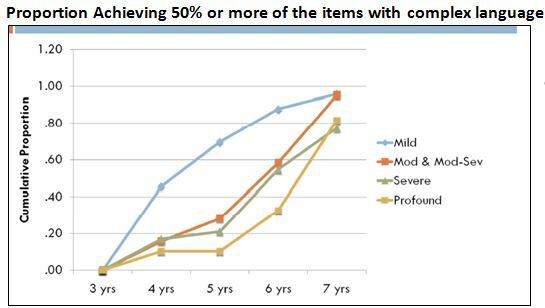 Information compiled by Karen L. Anderson, PhD, September 2013 for Supporting Success for Children with Hearing Loss. Updated March 2017.